Sheffield United beat fellow promotion contenders West Bromwich Albion at The Hawthorns to retake second spot in the Championship. Leeds had displaced the Blades with their home win over Bolton earlier on Saturday, but Kieran Dowell's winner in the day's late kick-off put Chris Wilder's side back into an automatic promotion spot. Albion, who failed to score at home for the first time in the league this season, were unable to find a reply and are fourth in the table, four points behind United. Midfielder Dowell headed in Martin Cranie's right-wing cross at the end of a flowing counter-attack to give the visitors their third successive win. Jay Rodriguez appeared to have equalised for the hosts but he was immediately pulled up for a handball - and he was quick to acknowledge that he had diverted the ball into the net illegally. Although Albion had the bulk of the opportunities, it was United who looked the most likely to score again. Goalkeeper Sam Johnstone pushed Marvin Johnson's effort around the post and kept out David McGoldrick's shot from a tight angle, when McGoldrick appeared to have better options in the centre awaiting a pull-back. Rodriguez and the returning Dwight Gayle, who had one snap-shot saved by Dean Henderson late on, were kept largely quiet by a Blades defence which was forced into a reshuffle at half-time when John Egan went off injured. Craig Dawson headed a corner straight at Henderson, while Mason Holgate and Rekeem Harper sent efforts from outside the box just wide. And Henderson was called upon again in the fifth minute of added time to deny substitute Jefferson Montero. United had surrendered a 3-0 lead to draw at Aston Villa in their previous away outing, but they saw off second-half pressure from the hosts to hold on for a third successive clean sheet. "It was a tight game where they got the all-important goal and we saw a very resolute Sheffield United side come and defend and protect what they had. "We tried gallantly in the second half, but we couldn't find the elusive touch to level the game. "My players gave everything, everyone could see that. But maybe it was just a game too far with the schedule that we've had, which we totally understand. "In the end, it looks like we ran out of a little bit of steam. I felt there was another gear to us, but we just couldn't find that." "We'll only know at the end of the season how vital that win is. It's a game we were really up for, we always are. "You don't get to be where we are in the table without being totally committed. "I don't think it was our greatest performance to be totally honest and there's plenty we'll be working on during the week ahead. "But, the character and commitment and general togetherness of the team has seen us win a tight game against some good players." 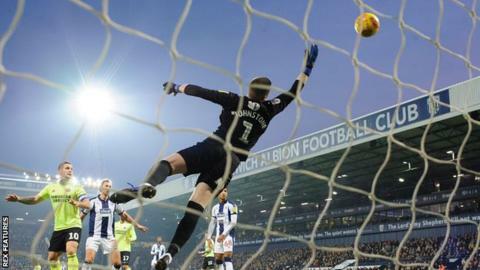 Match ends, West Bromwich Albion 0, Sheffield United 1. Second Half ends, West Bromwich Albion 0, Sheffield United 1. Attempt saved. Jefferson Montero (West Bromwich Albion) right footed shot from the right side of the box is saved in the bottom left corner. Gary Madine (Sheffield United) is shown the yellow card for a bad foul. Foul by Gary Madine (Sheffield United). Corner, Sheffield United. Conceded by Craig Dawson. Gary Madine (Sheffield United) wins a free kick in the defensive half. Attempt blocked. Kyle Edwards (West Bromwich Albion) right footed shot from outside the box is blocked. Assisted by Rekeem Harper. Offside, West Bromwich Albion. Tosin Adarabioyo tries a through ball, but Jefferson Montero is caught offside. Substitution, West Bromwich Albion. Kyle Edwards replaces Jake Livermore. Attempt saved. Dwight Gayle (West Bromwich Albion) right footed shot from the right side of the box is saved in the bottom right corner. Jay Rodriguez (West Bromwich Albion) is shown the yellow card for hand ball. Hand ball by Jay Rodriguez (West Bromwich Albion). Craig Dawson (West Bromwich Albion) is shown the yellow card. Delay in match Richard Stearman (Sheffield United) because of an injury. Enda Stevens (Sheffield United) is shown the yellow card for a bad foul. Attempt saved. Gary Madine (Sheffield United) right footed shot from outside the box is saved in the top centre of the goal. Assisted by Kieran Dowell. Foul by Marvin Johnson (Sheffield United). Attempt missed. Billy Sharp (Sheffield United) header from the centre of the box misses to the left. Assisted by Oliver Norwood with a cross. Substitution, Sheffield United. Chris Basham replaces Martin Cranie. Attempt missed. Dwight Gayle (West Bromwich Albion) left footed shot from the centre of the box misses to the right. Assisted by Kieran Gibbs with a cross. Attempt missed. Dwight Gayle (West Bromwich Albion) header from the centre of the box misses to the right. Assisted by Kieran Gibbs following a corner. Corner, West Bromwich Albion. Conceded by Kieron Freeman. Attempt blocked. Kieron Freeman (Sheffield United) header from the right side of the box is blocked. Assisted by John Fleck with a cross. Corner, West Bromwich Albion. Conceded by Enda Stevens. Attempt blocked. Dwight Gayle (West Bromwich Albion) right footed shot from a difficult angle on the right is blocked. Assisted by Jake Livermore. Attempt blocked. Jefferson Montero (West Bromwich Albion) left footed shot from outside the box is blocked.